We successfully ran our first 7T subject through fmriprep; however, the anatomical segmentation appears to be failing in the temporal lobes. I’ve read through this thread which inquired about the manual editing option, but I’m wondering if there are tags we can add to our command line to help with this segmentation (similar to how FSL’s BET allows for -f and -g to adjust the estimation of the brain). This does not appear to be a brain mask issue, but rather a segmentation issue; it also seems a bit much for manually editing. 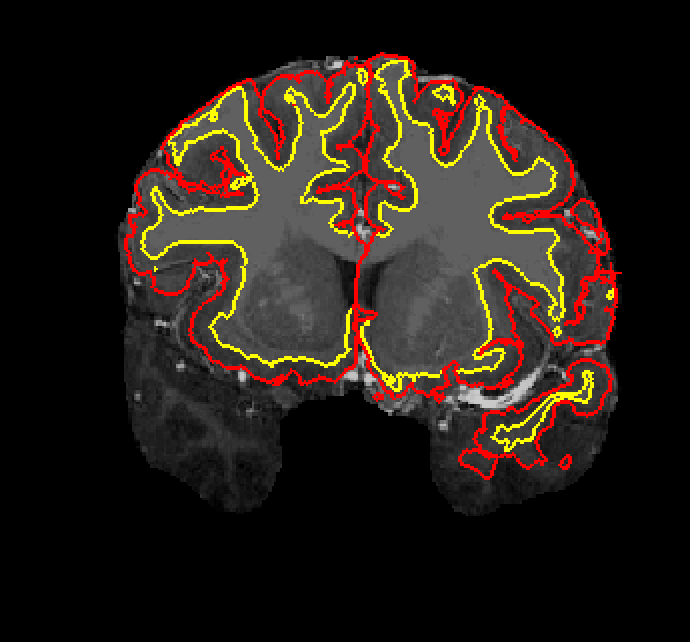 For reference, the red outlines are the lh.pial and rh.pial and the yellow are the lh.white and rh.white segmentations from the surf directory…overlaid on the T1/brainmask. What is your exact command line? And more specifically, did you use the --no-submm-recon flag? We didn’t use any other tags. I’ll give the --no-submm-recon a try! Hi, the --no-submm-recon option should be even worse (by theory). Could you share one of those T1w so that we can see whether the inhomogeneity correction can be made more robust?